«Собака на сене» is one of the very neat expressions we use. It is translated as “dog on hay”. The full saying goes: «собака на сене: и сама не ест, и другим не даёт», “dog on hay: she neither eats it herself, nor lets the others”. It is used when someone does not do something simply out of spite or uses something that others want just so they will not get it. Моя кошка любит спать на крышке унитаза - ну, не собака ли на сене? 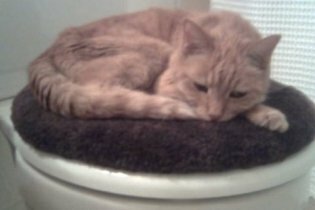 “My cat likes to sleep on the toilet cover – she is a regular dog on hay, isn’t she? There is a really great play written by Lope De Vega that is called «Собака на сене». There a beautiful duchess falls in love with her secretary. She cannot be with him because of the difference in their social status, but at the same time her jealousy is driving her crazy. She is torn between what her honor dictates her and what her heart yearns for. That makes her act like the dog in the proverb: she does not commit to either being with her love or agree to let him go. It is a beautiful love story with a very happy ending. This play was staged and made into a movie in 1977 by a talented director, Yan Frid. This adaptation is very popular and much loved in Russia. I would recommend for everyone to see it! One interesting word in Russian is кинология. The -логия ending corresponds to -logy in English and means "the study of." Every first semester Russian student knows that кино means the movies, so one could be forgiven if one thought that the word meant "film studies." Wrong! Кинология is the study of dogs and how to breed and care for them. The stem is borrowed from the Greek root cyn- which means dog. (The cee in Greek stems was always pronounced like the hard cee in cat, which is why it is represented by к in Russian. Nowadays in English we pronounce it with an ess sound, which misrepresents the original pronunciation.) We have a similar word in English, cynology, but it is uncommon. В 1984-ом году в Корее запретили продажу псины. The sale of dog meat was prohibited in Korea in 1984. В Вьетнаме суп варят из псины. In Vietnam they make soup out of dog meat. The word is also commonly used to just mean dog as well. If you search for псина on youtube.com, you will find all sorts of videos of people and their dogs doing all sorts of odd tricks, like singing to Gwen Stefani tunes. Почему здесь пахнет псиной? Why does it smell like dog fur in here? Фу, здесь воняет псиной! Ugh, it reeks like a nasty ol' dog here. Знаешь, я недавно нашёл прекрасные духи, которые пахнут мокрой псиной. Они меня спасли. Раньше девушки ко мне постоянно приставали, а теперь я могу появляться в общественных местах совершенно спокойно. You know, I recently found a marvelous cologne that smells like a wet dog. It has saved me. Women used to hound me constantly, but now I can appear in public in complete peace. Маша, псина ты некультурная, ты опять обидела клиента! Удивлюсь, если тебя не рассчитают. Mary, you rude idiot, you've offended a client again. I'll be surprised if they don't fire you. Боря, псина ты идиотский, я сказала, чтобы ты купил два кило сахара и пачку соли, а не два кило соли и пачку сахара! Boris, you complete idiot, I told you to buy four pounds of sugar and a packet of salt, not four pounds of salt and a packet of sugar. Note: see discussion of the last sample sentence in the comments section. There are two well-known созвездия constellations that contain this word, and they are Большой Пёс and Малый Пёс, which mean the Big Dog and the Little Dog respectively. In English we mostly use the Latin names for constellations, and the Latin word for dog was canis; thus we call those constellations Canis major and Canis minor.